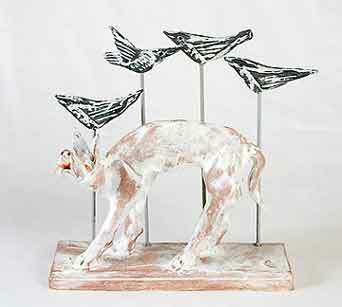 Ian Gregory dog and birds - 8" (203 mm) high. Ian is currently (2004) working on a project for Bristol Docklands, where he is constructing birds with 5 foot wingspans sitting atop 50 foot stainless steel poles. The birds' wing joints are articulated, and they are mounted on gimbals so that they will rotate to offer the least resistance to the wind. Many of his recent smaller sculptures have birds on poles, to help with ideas and inspiration for giant counterparts.